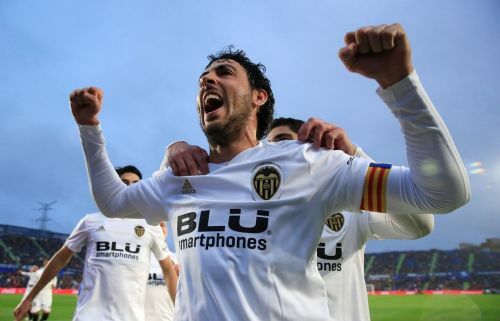 Valencia, one of LaLiga’s most storied and iconic clubs, are heading into their centenary celebrations in style, with an upsurge in form recently seeing ‘Los Che’finishing the season looking for success on all three fronts. Valencia CF was officially formed on March 18th, 1919 and are the fourth most successful team in Spanish football history, having competed in 84 of the 88 LaLiga Santander seasons to date, winning 22 trophies including six LaLiga titles, seven Copas del Rey and the 2004 UEFA Cup. But how did they get to where they are today? Within walking distance of the city centre, just across the old river bed of the Turia, is Valencia’s ‘Camp de Mestalla’, which has hosted the club’s games since May 1923, making it the oldest football stadium in LaLiga Santander. Regularly renovated over the decades, and a host of games at both the 1982 World Cup and 1992 Olympic Games, Mestalla currently seats 55,000 and is renowned to be one of the most atmospheric stadiums in LaLiga. The 2018/19 club captain is Dani Parejo, a Spain international midfielder who has emerged as a skilful and combative leader over recent seasons. Other vital squad members include Spain international striker Rodrigo Moreno, Central African Republic midfielder Geoffrey Kondogbia, Portuguese winger Goncalo Guedes and Brazilian goalkeeper Neto Murara. The club’s excellent ‘cantera’ youth system has also supplied left-back Jose Gaya and young midfielders Carlos Soler and Ferran Torres. South Korean starlet Lee Kang-In is another to watch for the future. The remaining months of the campaign will see Valencia aim for a top four LaLiga finish, as well as facing Barcelona in early June's Copa del Rey final and continuing to progress in the Europa League. Los Che look set to continue their success well into their second century of existence. 1. Why are they known as Los Che? Most LaLiga fans will be aware that Valencia are nicknamed ‘Los Che’, but not everyone might know why. ‘Che’ is an expression often used by people from the east coast of Spain, the 'Levantinos', as a colloquial way of saying ‘hey.’ As a result, Valencia fans are ‘Los Che’ - the ones who use this word to call attention. This Valencian style of speaking was noted by American author Ernest Hemingway when he visited in the 1930s, in the early years of LaLiga, and he used it in his classic novel ‘For Whom the Bell Tolls.’ It also made its way to South America when millions of people from the area emigrated in the 19th and early20 th centuries, hence Valencia’s link to the famous revolutionary Ernesto ‘Che’ Guevara. Valencia’s ‘Paterna’ youth academy is among the most famous and fruitful in LaLiga, having supplied a steady stream of top players to the first team throughout the club’s history. There has been an important core of homegrown players in each of Valencia’s six LaLiga title-winning sides, from Vicente Asensi and Inocencio Bertolin in 1941/42 to current LaLiga ambassadors Gaizka Mendieta and David Albelda in 2003/04. Recent and current Spain internationals David Silva, Carlos Marchena, Jordi Alba and Isco are also Paterna alumni who made their LaLiga debuts for Valencia. The current squad includes new Spain senior left-back Jose Gaya (23) and exciting locally born young midfielders and underage internationals Carlos Soler (22) and Ferran Torres (19). Valencia’s future is looking bright with such in-house talent continuing to break through. Former Valencia player and later club secretary Eduardo Cubells's connections with Brazilian football saw him travel to Rio de Janeiro in early 1958 and reach an agreement to sign an emerging talent called Edson Arantes do Nascimento following that summer’s World Cup. The 17-year-old was already making a name for himself as Pele with his performances for hometown club Santos in the domestic league and cup. But then six goals at the World Cu finals in Sweden, including a double as Brazil beat the hosts 5-2 in the final, saw him leap overnight to global superstardom. That made Santos rethink their plan to sell and Cubells did not get his man. Although Pele did travel with his hometown club to Valencia for the traditional summer ‘Trofeo Naranja’ tournament the following year, scoring a goal in a 4-4 draw with the hosts at Mestalla, he never joined the club. Imagine how different history would have been! Since medieval times a bat has been the heraldic symbol of the city of Valencia, as according to tradition the nocturnal mammal played a key role in a 13 th century battle for control of the city. The same bat has always held pride of place on Valencia football club’s badge, and a new and modern orange symbol was unveiled earlier in 2018/19 bringing together the team’s past, present and future in this their centenary season. 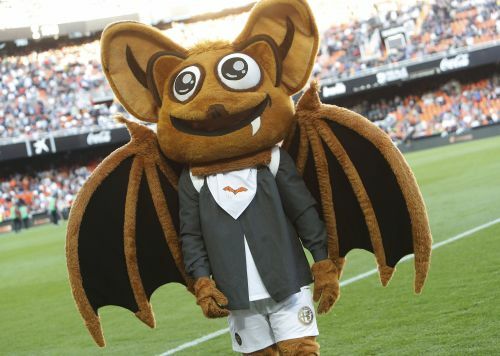 The club mascot is also a larger than life bat named ‘Rat Penat’ who supports the team and leads the cheers for each home game at Mestalla. 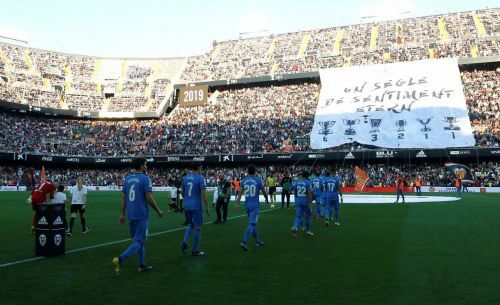 Valencia’s club hierarchy have organised a series of events to mark the club’s 100 th anniversary celebrated on March 18th , with one of the most emotional being a new statue inside Mestalla marking the team’s connection with its fans. A striking bronze statue has been situated at the seat where Vicente Navarro Aparicio, Valencia club member number 18, sat at every home game until his passing in 2016. Navarro was much loved for decades around the club, travelling for decades to away games even after losing his sight aged 54 due to a detached retina, with his son (also called Vicente) attending games with him to describe events on the field as they happened. The lifelong fan described the season of his team’s last LaLiga win in 2003/04 as the happiest year of his life. The statue, which now sits on seat 164 of row 15 in the Tribuna Central section now serves as a permanent reminder of what it means to follow Valencia CF.